Alright, so, Ford’s performance-oriented ST lineup is admittedly a little thin. But that’s fine, because Ford is going to give us an Edge ST and also, possibly, an Explorer ST, too. Nothing screams fun like performance crossovers and SUVs, I always say. 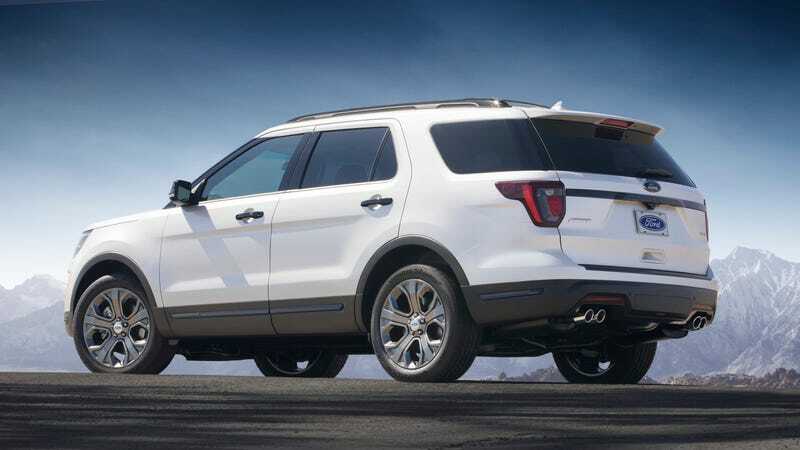 Ford will pluck the 3.0-liter twin-turbo V6 that currently lives in the Lincoln Continental and MKZ and stuff it into the 2020 Explorer ST, according to The Truth About Cars, which sites unnamed sources. That engine currently makes 400 horsepower and 400 lb-ft of torque, but TTAC expects an increase in power in the ST version. Additionally, TTAC has also reported that the Explorer could go rear-drive, so if both of these things actually materialize in the next-gen model, I’d actually be a very happy camper indeed. A 400-plus HP rear-driven SUV? That’d be pretty badass. I’m not holding my breath for a manual option, though. Life isn’t that good. Likely what will happen is that the Explorer ST will get Ford’s 10-speed automatic. But can you imagine getting chased down the highway by a police Explorer ST? It’d almost be worth it to see police camped out on the sides of highways to get a glimpse of the new police vehicles. When TTAC tapped Ford for comment, a spokesperson responded that they don’t speculate about future products.